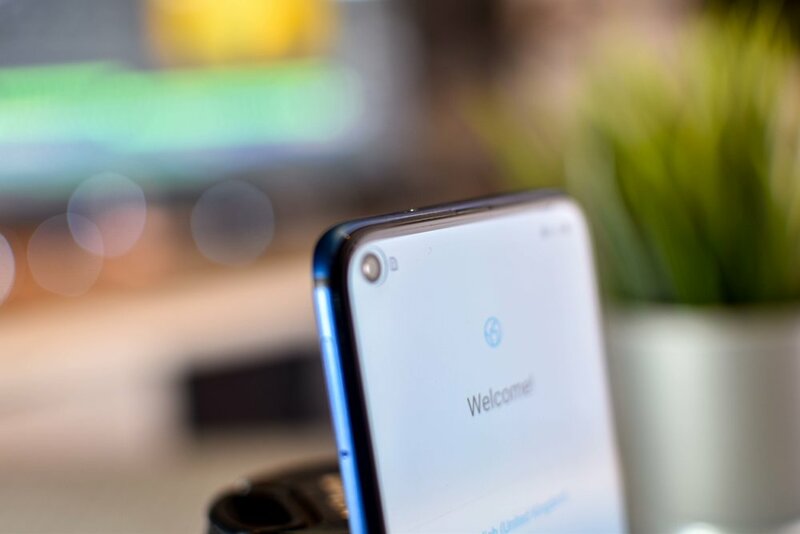 So you may not think it but the Honor View 20 is a big deal. It hasn’t got the biggest screen or best specs, its not even (in my opinion) the best looking phone out there….but the Honor View 20 points the way to the future, we finally see a leading brand (albeit a sub division of Huawei) lose the notch and is the first to adopt the ‘hole punch’ style edge to edge display with the under-screen front facing selfie camera. Imitation is the highest form of flattery and 2019 may see others follow suit, time will tell! This mid-range smartphone’s price tag could well attract those on a budget who don’t want to compromise on features, with highlights including an industry leading 48MP rear facing camera, 4000 MaH battery and 128GB minimum onboard storage but is the starting price of £499 / $580* not confirmed us price worth it, lets dig deep and find out. For a mid range smartphone the build quality is pleasing, no real concerns and the most obvious new feature is the front ‘All-View display. The 6.4inch screen with just the smallest ‘hole punch’ or cutout housing the under screen ‘selfie-camera’ is a delight and a real leap away from the often unpopular notch style which most leading brands in 2018 adopted. The remaining sensors have been moved away from the front and are now housed on the top side and rear. A simple yet striking and very unique design element is the almost holographic ‘V’ effect on the rear, which I think looks awesome! It is definitely subtle but I promise you, you will find yourself moving the phone in peculiar patterns to see the almost 3D effects in a seemingly hypnotic way! The front and back are glass panels and the edge is maetal which makes sense and also pleasing on the eye. Another strangely rare feature nowadays is the adoption of a headphone jack which which will certainly please our those die-hard 3.5mm cable fans out there. This is also good as the single speaker lacks punch. Connectivity via Bluetooth is also great and the compatible AptX HD feature for compatible headphones was an unexpected bonus. The display is more midrange and reflects the price with an uninspiring yet not disappointing 2310 X 1080 resolution, This is an LCD screen as you would expect at this price and although we found it to be bright and vivid it wasn’t as crisp as some of the higher resolution OLED displays out there. I am being ‘picky’ and most users will be more than happy with the bright display and will love the lack of ‘notch’ and the extra real-estate that this gives you. The ‘hole’ is still in line of the notification bar and not completely unnoticeable but it is a definite marked improvement and when watching movies or playing games it soon became ‘invisible’ to me which I guess is what Honor were hoping. The specs beneath the display are also impressive for the price with our base model having 6GB of Ram, 128GB flash storage and an AI enabled Kirin 980 Chipset with dual core NPU obviously the other noticeable ‘under hood feature’ is the Worlds first under-screen 25mp camera. With it’s USBC connection the 4000mAh battery offers ‘SuperCharge’ which gives as much as 50% charge in as little as 30 minutes. And a full charge has been tested by Honor to deliver 130 Hours Music playback, 15 Hours Video playback and 25 Hours of 3G calls. You are also extremely unlikey to suffer the infamous ‘AntennaGate’ Issues of previous smartphones as the Honor View 20 has ‘Triple-Antenna Wifi’ which means no matter how you hold the device a strong wi-fi signal will be maintained! Dual Frequency GPS offers means ‘10 times’ more accurate positioning especially useful in built up urban area’s. Although in Honor’s small print on there own website they say ”10 times” is a theoretical value only which is the best marketing line ever! The already mentioned worlds first under screen front camera is 25MP and in standard mode delivers I feel the best performance, you can play around with lighting and beauty effects but these can end up delivering unnatural results. The rear facing is lens is the first 48MP sensor on any smart phone this translates to 8000 x 6000 pixels the highest on any phone ever! and although it is just a single lens this is superb, with an aperture of f1.8 you will get some outstanding results. Other features include ‘mothership’ Huawei’s excellent night mode, 3D Sensor, and Artificial intelligent stabilization (AIS) all add up to produce a photographic experience that would warrant a far higher price point. With Image sizes up to 48MP this translates up to 12MB per photo which means Zooming and Cropping really does negate the need for a second focal length lense. Now although photos in standard mode may not be as Crisp on the View 20 as some of its rivals we did feel that the colour balance was the most natural and true to life. But if you switch into HDR mode than it is almost impossible to tell this apart from any of the other leading and more expensive models. With AI and software tweaks the user has plenty of options to suit their own prefrences and needs. Video is great, clear detailed and natural colours and with EIS turned on you will enjoy an almost shake free experience. With so many options and features we will go into more detail in a Camera exclusive video in the near future. Running Android 9 with Honors Magic UI 2.0 over the top which works well is smooth and consistent, being so close to Huawei you will definite notice similarities to their EMUI 9 however we understand that future updates are likely to reduce this similarity and make the Honors UI more automonus. What a way to start the year, not only for our first smartphone review of 2019 but a real contender that delivers on multiple fronts. The negatives are few, some people may not love the Magic UI 2.0 but hopefully this will improve in time and certainly there are so many positives which make this a real contender and a definite recommendation if you have £500 to spend. We will update you on potential US release dates as we get them. *Links away from this page may be affiliate links where we earn a small commission, you the customer pay no more.